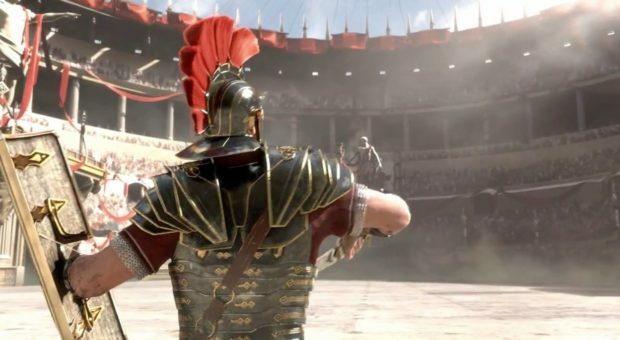 A joint panel of Microsoft and Crytek at Comic-Con today detailed the stories of characters found in the upcoming exclusive launch title for Xbox One, Ryse: Son of Rome. In the game players follow Marius Titus, a roman soldier who has sworn an oath of revenge upon the barbarian hordes for murdering his family. However his plans of revenge will have to wait for he must first rise through the roman ranks as a leader, strategist and soldier. Here is what the panel reveal for the following characters. Marius – The hero of “Ryse: Son of Rome,” Marius is a young soldier with a strong sense of duty who is completely dedicated to Rome and her ideals. Initially eager to fight against Rome’s enemies and expand the Empire, he soon realizes that Rome is vulnerable to an even more insidious threat than the barbarians he faces on the battlefield. Ever loyal to Rome, he resolves to rid the Empire of her true enemies. Vitallion – A wise and charismatic general who has served Rome for decades, Vitallion has fought in many campaigns and serves as a mentor to Marius. As events transpire he begins to wonder if duty has its limits, and whether self-restraint is always the correct course of action. Nero – Nero, Emperor of Rome, struggles to maintain his grip on power. He promotes his two sons Commodus and Basillius to powerful positions, letting them take control of the rebellious province of Britannia. Nero feels threaten by all potential rivals and exacts ruthless retribution against anyone who crosses him. Commodus and Basillius – As governor of Britannia, Nero’s eldest son, Commodus, sees himself as a god, and the people of Britannia as his subjects. His reign is characterized by brutal repression. Nero’s youngest son, Basillius, enjoys anything carnal or cruel. At the Colosseum he delights in watching gladiators kill each other, and lords over the terrified slaves he keeps in his harem in the bowels of the structure. Boudica – The daughter of King Oswald, the ruler of the Britons. Strong and resilient, Boudica hates Rome, and with good reason: under Roman rule, her people are made to suffer horribly. When her father faces horrific retribution from a perceived insult, it galvanizes Boudica and she rallies her people to rise against their oppressors. Boudica is a principled woman and has the will to go to the ends of the world to save her people. Oswald – Benevolent king of the Britons. He leads a rebellion against the tyrannical rule of Rome, but when the Romans brutally repress the rebels, Oswald submits to Roman dominance in hopes this will spare his people. His naivety leaves him vulnerable to the Romans. Glott – Enigmatic leader of the Northern barbarians, rumored to be more beast than man. Very little is known about him except that he is fiercely independent and will make war on both the Romans and Oswald’s tribe. The Spirit Gods – Immortal spirit, one who watches over humanity, guides Marius. She appears in mortal form, but radiates an otherworldly aura. Another – known in mortal form as Aquilo – seeks the destruction of Rome and allies himself with her enemies. In addition to the character portfolios, Microsoft also announced a new digital interactive graphic novel which is now available online here. Those who read through the novel will unlock collectibles that can be redeemed in the game for multiplayer bonuses. Microsoft hasn’t revealed that the bonuses are but we can expect some kind of XP booster or weapon enhancements.